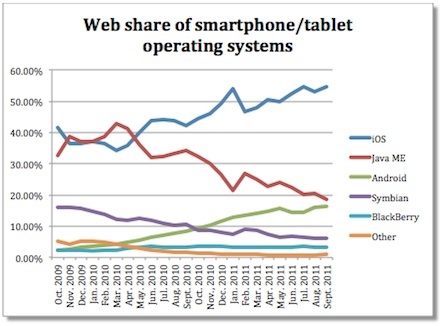 "Net Applications has come out with new numbers showing mobile OS market share." You can see a little dip there in February of 2011, but iOS is back on the rise, and the only other one on an upward course is Android. While not as steep, a rise just the same. I think the other ones should just give it up. I doubt they are going to be around much longer anyway if this keeps up. What are your thoughts?